Hey stampers! Christmas is over and now it's time to look forward to the new Occasions catalog and Sale-a-bration! 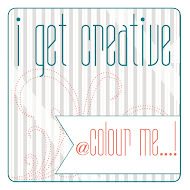 I'm giving a little sneak peek in the latest sketch challenge for Create with Connie and Mary. 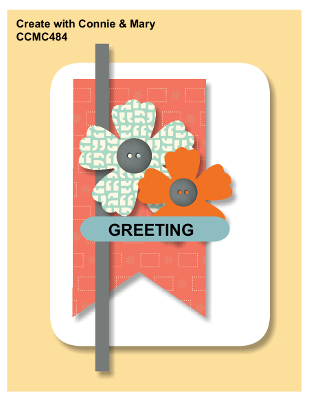 My card this week features the new stamp set Petal Palette and matching framelits Petals and More. I colored the images with our new Blends markers, which are so fun to play with and then used a little piece of Merry Little Christmas DSP, since it was still laying on my desk...left over from Christmas! 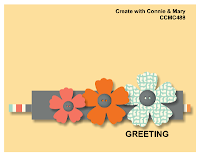 I hope you'll find time to join us in the CCMC sketch challenge this week! Just add your card to the facebook group! Hello stampers! Another week has come and gone...can you believe Christmas is right around the corner? In just a few days we'll be celebrating the birth of our Savior, having Christmas dinner, and spending time with family! What a wonderful time of year! 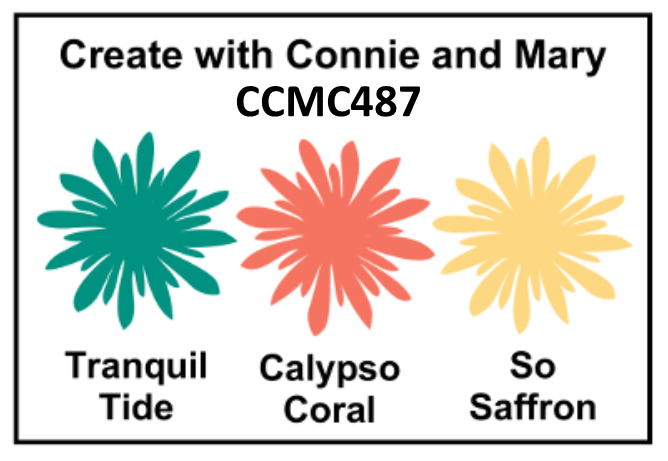 But right now we've got a new Create with Connie and Mary challenge at hand...a color challenge! 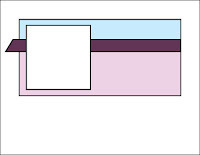 Look at these fresh, soft colors. They remind me of spring, which is the next season to look forward to! I decided to go with that spring theme and do some pretty fig flowers in a jar. 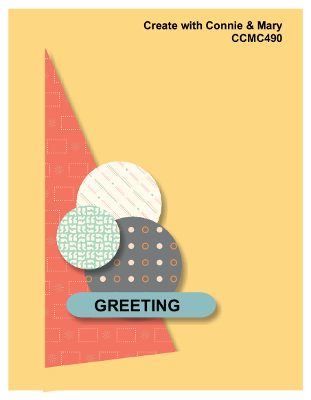 I mixed in the sketch from Global design project to help me along with my design team card. Merry Christmas everyone! 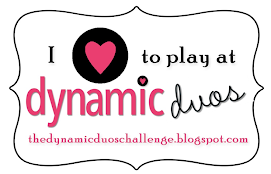 I hope you can find a little time in the hectic holiday season to play along with our challenge this week! I've never been a fan of repeated patterns so I tried to come up with something that went together and had three different sizes. I was first going to go with the Jar of Love set and then I spied the Coffee set. I thought that I could do something fun with this! It fit in with the color challenge from Merry Monday where we could choose any three colors to use in a Christmas card. I chose Melon Mambo, Real Red, and Wild Wasabi. I'm interested to see what everyone else does with this sketch! It was kind of a hard one for me! Hello stampers! 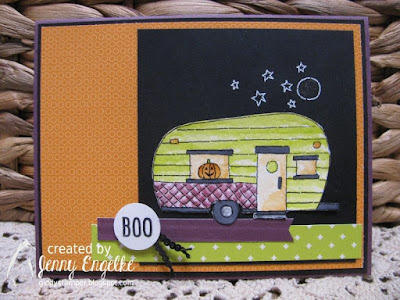 Today I'm sharing with you a card I made for the newest Hand Stamped Sentiments Challenge. When I first looked at these colors I didn't know what to do. They are so summery and I'm still in Christmas/Winter card making mode. Believe it or not, I finally just got this Painted Harvest set. I know, I know, I'm late to the party! Hey, better late than never, right?! Anyway, I thought the two step stamps of this set might make for a nice match for this color combo. I stamped the sunflower in Daffodil Delight and topped it with Calypso Coral and then stamped the leaves in Lemon Lime Twist and topped them with Bermuda Bay. For the background I went for (again my new) Foil Frenzy DSP. I think it's actually Old Olive, but it could also double for Lemon Lime Twist....and that's what I'm doing with it! I paired it with Calypso Coral retired DSP and stuck with those to main color so it wouldn't get too busy. I stamped the sentiment in Bermuda Bay to showcase that color a bit more too. I really enjoyed the way this came out in the end! I hope you'll be able to join us in this challenge! Happy Thursday everyone! 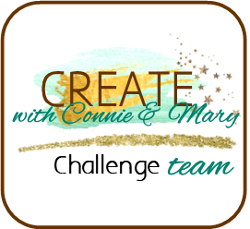 It's Create with Connie and Mary Challenge time again! We've got a rich, bright color challenge for you this week. I'm in such a Christmas mode that it was hard for me to break away from making Christmas cards! I just love this time of year. Christmas cards are my favorite to create. Anyway, I decided I wanted to play around with my Blends markers again, so I chose a big flower from Remarkable You. Since I stamped it with the Black Memento ink, I decided to add some black cardstock in there as well. I also added a touch of gold in there for added elegance. To help me along with my design team card this week I opted to use the sketch from Try Stampin' on Tuesday #351. It's been quite a while since I played along with that challenge so I'm happy to join up again! I hope you'll join us this week using these fun colors. 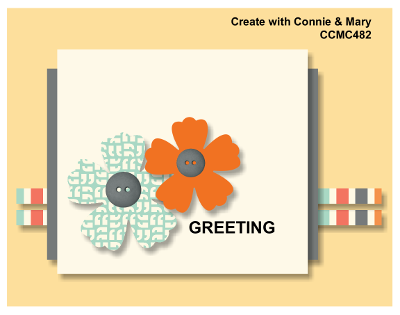 Just upload your card the the Create with Connie and Mary Facebook page! Hey there stampers! 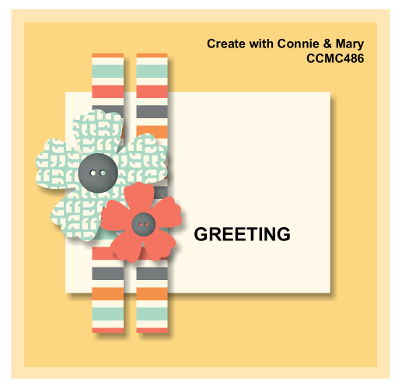 Create with Connie and Mary Sketch Challenge #486 is here! I combined my sketch with Global Design Project #115 Christmas Joy Theme and Addicted to Stamps and more #270 Photo inspiration. This is probably one of my most favorite cards I've done yet this Christmas. 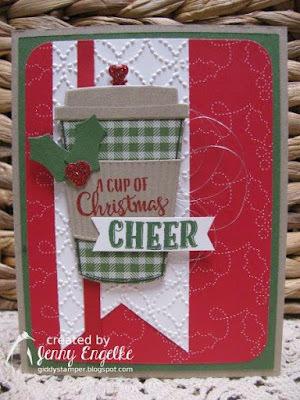 Number one, I'm a huge, huge fan of Buffalo Plaid anything and when I saw someone else somewhere take the black and white plaid paper from Merry Little Christmas DSP pack and sponge it with Real Red I fell in love and HAD to try it myself! I LOVE the results!!! I mixed it with some Always Artichoke, tones of brown for the pinecones and a touch of gold for a little Christmas shine. Favorite reason number two is the Pretty Pines. I was thrilled when I saw they brought this stamp and thinlit set into the annual catalog. It's one of the best Christmas sets ever, I think. And It doesn't just have to be Christmas either. It can just be woodsy. I cut one of each of the pinecone thinlits from Pretty Pines in Crumb Cake, Chocolate Chip, and Early Espresso and then layered them together. I like the solid, substantial look it gave them. Once I had them glued on I gave them a brush of Wink of Stella for a bit of shimmer. Everything was topped off with a couple of bows and a gold gem. The JOY diecut is from the Mini Treat Bag Thinlits set. It originally said ENJOY but I cut the EN off. I certainly hope you'll join us this week! Just share your card in on the Create with Connie and Mary Facebook page. Hello Stampers! 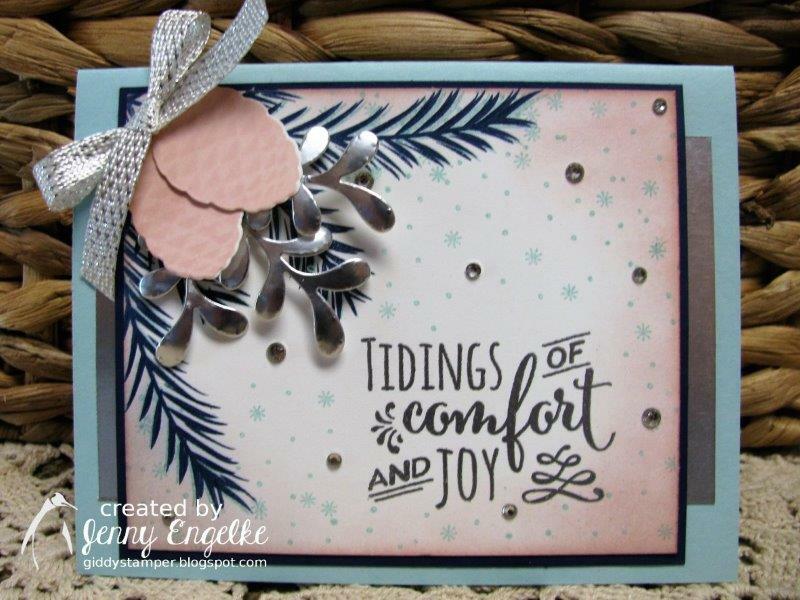 It's time for another Hand Stamped Sentiments Challenge. This time we have a Christmas inspiration for you! I got to choose this time's theme and I thought it would be fun to go with comfy, cozy, country Christmas. I chose to be inspired by the top pillow in the top left picture. I like the little neutral houses sitting atop a snow hill. I tried to mimic it the best I could. I placed it all on a piece of Wood Textures DSP to add some texture to the background. I also stamped and embossed snowflakes in the sky. I added the cross-stitching from the Christmas Quilt set to give a handmade feel. Here's a better picture of the snowflakes. I also stamped the inside. I don't always do this but I think it make the card a little more special. I hope you'll be inspired to play along with us this time! Hello stampers and happy Thanksgiving! I hope your day will be filled with family and gratefulness! 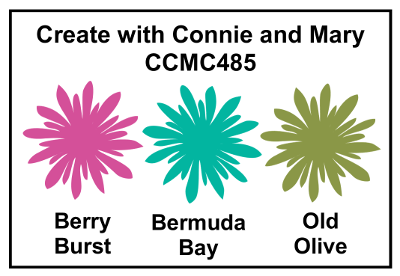 Today we've got a bright color combination for you at Create with Connie and Mary! Be sure to share your card with us at the Create With Connie and Mary Facebook page. I decided to go with a nice little Christmas Village scene. I used watercolor paper and splashed on Berry Burst and Bermuda Bay onto the houses and some Old Olive onto the trees. The background is from the Color Theory DSP pack. I added sparkle in the form of Dazzling Diamonds paper as well as Iridescent Ice embossed stars and some Iridescent Sequins. I hope you'll find time to play along with us! Thanks for taking a peek and have a blessed day! Hey there! 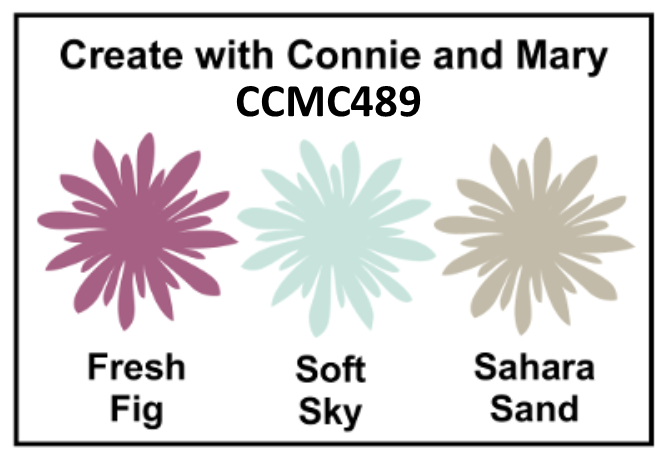 Today starts another Create with Connie and Mary sketch challenge! I just placed a big order and finally got my hand on the Merry Cafe and Coffee Cafe sets, as well as the matching dies. Honestly, I don't know what took me so long to order these! So, they just showed up in the mail and I was eager to play with them! 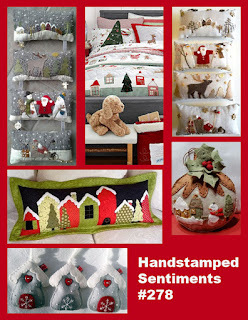 I think they go so well with this festive Christmas Quilt DSP. This DSP is chock full of fun, fun patterns! I love all the little details that come with the Coffee Cups Framelits. That little heart stopper is just the cutest!!! I love the texture on the coffee sleeve as well. It's just so fun! I added in a punched holly from the Holly Berry Builder as well. I like the added sparkle from the Red Glimmer paper. I'm also adding my card over at Addicted to Stamps and More #268...keyword Holiday. 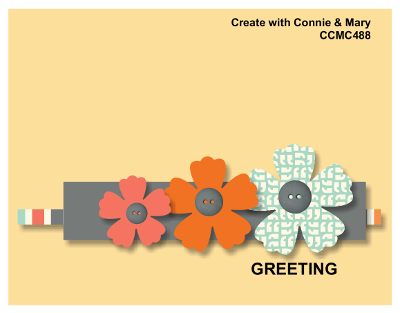 I hope you'll play along with us at Create with Connie and Mary. Just hop over to the CCMC facebook page to enter your card! Hello stampers! 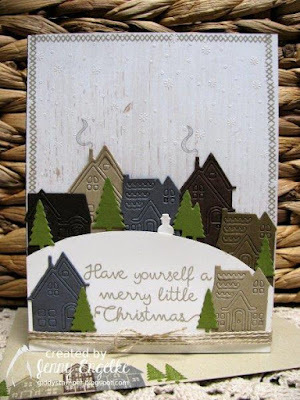 It's sketch time at Hand Stamped Sentiments and this one was designed by yours truly! I love the simplicity of it....which is something I never thought I'd ever hear myself say. Usually my mantra is more is more! Anyhoo, I hope you'll find time to play along with us! 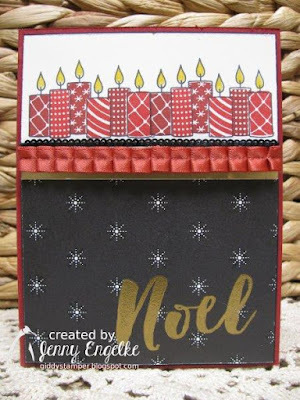 I chose to use the candle stamp from Merry Patterns. I was a little late to the game with the Merry Patterns set. I kept thinking I didn't need it and then quickly tried to get it before it became extinct. I used Real Red and Cherry Cobbler on my candles and combined it with classic black and gold. Pretty classy if you ask me! The Cherry Cobbler ruffled ribbon is probably from about 4 or 5 years ago but I'm determined to use up some of my old supplies when I can! 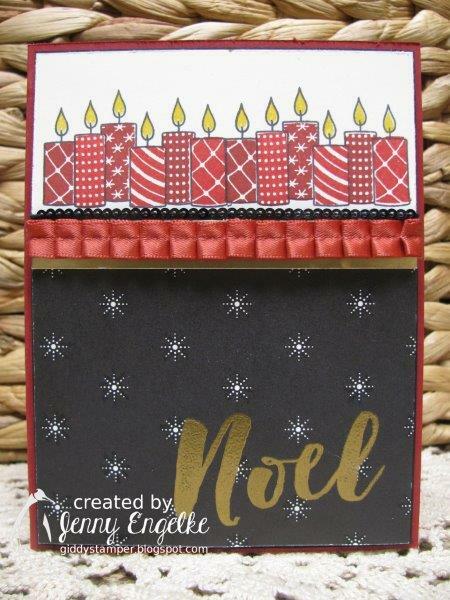 The Noel sentiment is from Christmas Pines and is embossed with gold embossing powder. Hello stampers! 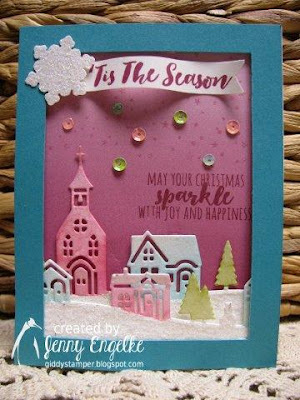 I had recently seen a post by another stamper and the main color of her Christmas card was Powder Pink. At the time I thought to myself that I've neglected Powder Pink and I should think about making a Christmas card with that color. 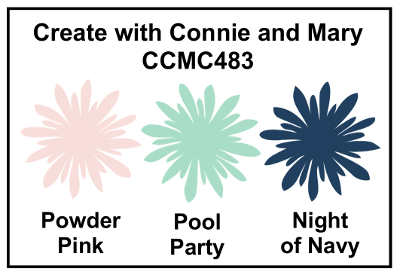 Well, enter Create with Connie and Mary Challenge #483-- low and behold the current color challenge uses Powder Pink along with Pool Party and Night of Navy! What a wonderful combination. 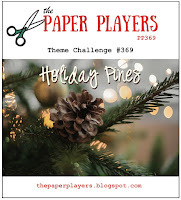 Also recently I had seen some pink pinecones which I thought were so pretty and interesting and then low and behold the Paper Players current challenge asks us to use holiday pines! This was kismet for me!!! I love the way my pink pinecones and blue pine bows turned out! I added a little bit of silver in there to create a bit of shimmer and shine as well! Also, I brought back the sketch from last week's Create with Connie and Mary Challenge! 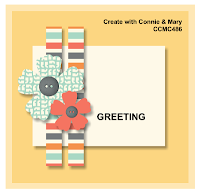 I hope to see you playing along with us at the Create with Connie and Mary facebook page. Hello stampers! It's sketch week at Create with Connie and Mary! I actually love this sketch. I don't know what it is, but I really enjoyed putting it together! Maybe I enjoyed it so much because I got to color the Glamper Greetings set with the new Blends alcohol markers!!!! I'm so excited they're back! I really love the rich colors you can achieve with them with very little effort. 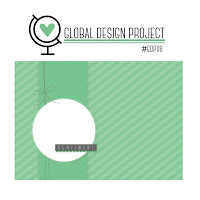 I also used the theme from Global Design Project this week: Family Time. As a family we love to camp. It's always great, quality time spent together. It's hard to see (I wish I had gotten a better photo) but the windows and door are all wink of stella-d, as well as the star on the tree. It looks so sparkly in person and totally makes the card, I think. I also added two lengths of the mini black sequin trim over my black dsp strips. It gives it just a hint of extra texture in real life. 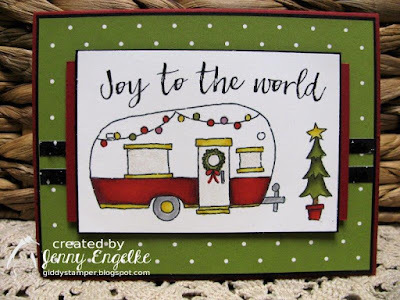 I also wanted a nice big sentiment to go over the top of the camper, so I pulled out "Joy To The World" from Hearts Come Home. Hello Stampers! 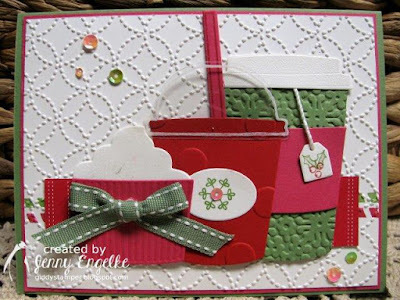 Today's post is for Hand Stamped Sentiments color challenge #276. 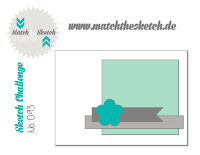 I also used Match the Sketch to help me along with my design. 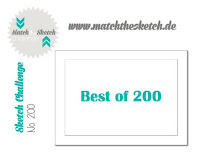 They are celebrating their 200th sketch by letting us choose which sketch out of the 199 we'd like to use. I chose #93. I decided to go with my Glamper Greetings stamp and watercolor these Halloween-ish colors onto the cute little camper. And how about that fun little jack-o-lantern in the window? So very, very cute! I must say that it was fun to color this one. I trimmed it all out and layered it onto some black cardstock after I had stamped and embossed the moon and stars. I added in some coordinating DSP and BOOM....done! I love how this one came out! Join us at HSS for our newest color challenge! 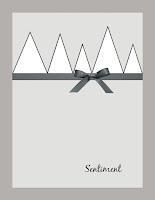 We're looking forward so making comments on all your fun cards!